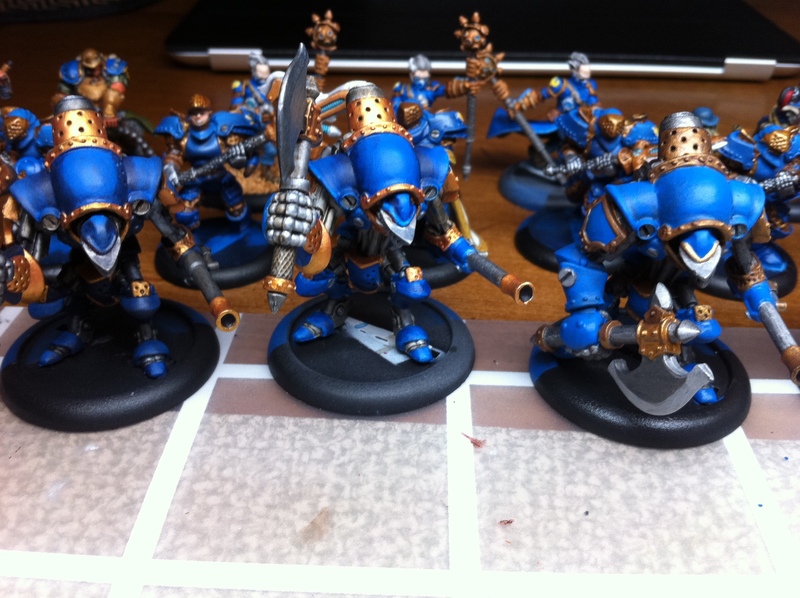 Varnishing a Cygnar Army with Liquitex Gloss & Matte Varnish | 30mm Madness! As I need to varnish/seal an entire cygnar army… I’m trying various finishing techniques and I think I’ve found the best. I applied un-thinned liquitex gloss varnish first, and you can see the very glossy finish on the hunters in the picture to the right. After waiting the recommended three hours between coats, I applied the matte varnish with the airbrush, and was impressed with the ability to control (roughly) where I wanted to dull down the varnish. In the picture below you can see where I sprayed the matte varnish to the blue armor area and left the metallic smoke stack glossy to preserve the metallic sheen. The varnish feels very durable, handling the mini feels like a harder/more durable surface than the ‘raw’ acrylics, without being really apparent when looking. It also feels like there was never even a remote risk of frosting like with the aerosol cans. This entry was posted on March 27, 2011 by justinhardin. It was filed under Modeling & Painting, WarMachine . 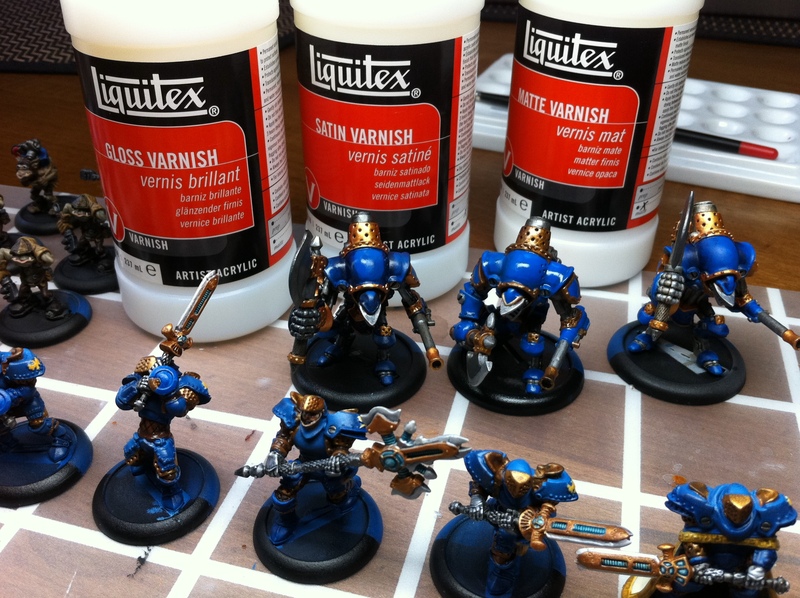 Hey there, I’ve looked over your site quite a few times when I was looking into information on brush on varnishes for my models, and needless to say your photos sold me on using the Liquitex products. I have been thoroughly pleased with the gloss and matte varnishes! In this article you have shown a bottle of the satin varnish and I was wondering if you have any info on that product? I have a few models that are highly metallic colored and I want to keep that type of sheen that metal has, but I’ve been feeling that the straight gloss is a bit too shiny/wet looking, so I’ve thought about getting the satin varnish to try out. Have any advice? I’ve continued using the Liquitex varnishes since the above post, and use gloss, satin, and matte. For the final ‘finish’ coat, lately I’ve been mixing the satin and the matte varnishes to ‘dial in’ the shine level. The gloss varnish is always applied first for ‘toughness.’ For pieces that I really want to protect I spray on two coats, after which firm scratching from my fingernails doesn’t damage the acrylic paint underneath. Pure matte can leave the model looking a bit ‘dusty’ and can kill contrast. The bottom picture of the rhino is without matte varnish, while the top pictures are with the matte applied. As you said in your post, leaving the gloss can leave the finish looking wet. The guns in the Imperial Strong Point were left glossy, maybe too soo. A decent example of a mix (I think it was close to 50/50) of satin and matte is the dreadnought. I wanted to dreadnought to look ‘clean’ but not ‘shiny/wet.’ I’ve also tried straight satin, but for surfaces that are supposed to look like painted metal, it’s still a bit to shiny. For coverage over metal, satin might be a great choice. You can always try it, and if it’s too shiny add some matte to your mix and apply another coat. As long as you’re applying light coats, the worst case is that it’ll take another few hours (let it dry between coats!) but you’ll get a tougher protective finish. I finished a commander dante (gold metallics) with a 70/30 satin/matte varnish. Unfortunately I took the pictures before applying the varnish. The varnish actually helped smooth out the finish, preserved the metallic/reflective nature, and doesn’t look wet. I learned on this model that the GW metal models really need some milliput washes applied before the primer to avoid the grainy/rough texture. Yea, I’ll definitely have to try the straight satin first and see how that turns out, then play around with mixes if need be. I do know what you mean though about that “dusty” type look from just a straight matte varnish, but I do find that its not as bad on my end, perhaps since I am painting it on as opposed to airbrushing it on. For the models in particular that I am working with is a armored “knight” type Reaper figure and an old GW Necron Lord, with the only non-metal bits being the facial skin/hair, capes and leather straps. For these areas I find that the dulling matte has worked pretty darn well. I hope to get a bottle within the next few days, so I can test it out and send you some links once I photograph the finished models. I know this is old, but are you thinning these at all? Your Rhino photo is what modelers call “frosting” which can happen with top coats that are not thinned properly, or room climate is wonky. Are you talking about this rhino? It’s not frosted it’s just pure matte varnish. I’ve definitely run into varnish frosting before. According to the liquitex website, the varnishes I’m using should not be thinned. What varnish and thinning method do you recommend?